Every year brands release new boards with new graphics and features, but it's rarely the case that a brand introduces a staple product, one that is likely to transcend trends and leave a lasting mark in the industry. The Aleka, a collaboration between Surftech and Prana, has done that. With a beautiful play of features, design, and color scheme, Surftech's Aleka has excruciating details in color coordination while also delivering an excellent board design that caters to both the male and female market. And to boot, it's wrapped up in environmentally responsible material, reducing waste and carbon footprint from its traction pad to even its resin. It is with great excitement that our editorial team gives Surftech's Aleka the Supconnect Gear of the Year Awards 2018 for Overall Gear of the Year. The waters of Maui, Hawaii present some of the most challenging conditions around, so when Naish puts its boards through the ringer, quality products are bound to come out. And here the Naish Nalu is no surprise. It performs as a highly capable board to use on flatwater like lakes and lagoons – hauling kids, gear, and fun – but at the same time can be ridden in various surf conditions, exuding the hallmarks of a stellar all around paddle board. To complete the package, the gradient Hawaiian patterns, overlaid with a well-thought out show of yellows and greens, brings a true island feel to the board, having "fun" written all over it. For that reason, we're proud to announce Naish's Nalu as the All Around Board of the Year for the Supconnect Awards 2018. Buzz and popularity by themselves are not enough to earn one of Supconnect’s awards. But sometimes, all the chatter around a product has real substance behind it. And here is where SIC Maui’s Rocket Ship, aka RS, has taken the world by storm. Tagged as an “All Water” Race Board, the RS introduces several variations of previous models in the SIC Maui line, but all in one crazy fast rocket ship. The squared tail offers plenty of stability on buoy turns and technical conditions; the deck has drainage holes to avoid the lower standing position from accumulating water; the lower deck lets the paddle stroke to engage with more power; and the combination of the bulbous nose, rocket, and rails all coalesce into one fast machine, rolling through bumpy rides and slicing through flatwater. Here, buzz and popularity are the byproducts of a truly extraordinary SUP race board, SIC Maui's RS, Race Board of the Year in the Supconnect Awards 2018. The balancing act between production and custom surfboards is no easy feat. Learning from the design features that empower the best surfers in the world to shine, but then importing them into a board for your average consumer to rip is one of the toughest challenges for board designers. And there are few products that strike that ever-fleeting balance. Fanatic's Allwave is one of them. With the wider nose, the board offers extra stability for the paddler. But at the same time, the foiled rails, pulled in tail, and play on rockers let surfers unlock that board's maneuverability, much like a pro. The play of colors also works really well, both on bottom and deck. And the options of fins, let's each rider pick his glide style. With that incredible balancing act Fanatic's Allwave has truly earned Surfboard of the Year in the Supconnect Awards 2018. A product sometimes checks all the boxes in its product category. Occasionally, that same product goes beyond, excelling in other areas as well. That’s no easy feat. Here is where the Boardworks Great Bear comes in. It checks all the boxes of an excellent touring board. It has a great platform for gear; it’s stable; has great glide; comfortable deck; nice handle; etc. But what's truly impressive is its ability also to perform as an excellent distance board, capable of handling flatwater but also challenging ocean conditions like Hawaiian channels. That puts the Boardworks Great Bear in its own category, owning the top spot for Touring Gear of the Year in the Supconnect Awards 2018. There must be a beautiful quote somewhere saying something like, "Life to be fully experienced must be wrapped up in visual and emotional depth" – some grand statement along those lines. However the words turnout, products sometimes do that to people. Their graphics and construction jump out of the shelf, immediately connecting at some deeper level. That's the BOTE Flood Classic. The painfully intricate attention to detail, color coordination and construction are simply eye candy, evoking nothing short of an emotional tug to the heart. The traction pad incorporates all the colors on the board, from top to bottom. Even the bungee cords match the aqua green gracing the board's logo. Given that much thought and stunning execution, it's with a full round of applause that the BOTE Flood Classic receives Graphics Gear of the Year in the Supconnect Awards 2018. To be honest, it's quite strange to have an awards category for the paddle board rental market. And yet, when you think that half, if not most, of the people stand up paddling are on rental fleets, then it settles the score. It needs its own award. And what's more, the Rental Gear Award must recognize brands raising the bar of excellence in this tough category, where low price point meets product durability. The problem is that this combination almost always delivers ugly, ungodly heavy boards. That's where Surftech's Lido shines, yes, truly (not literally) shines – sorry for the confusion, we just got excited. It's very durable construction is not – we repeat, "is not! – ungodly heavy. It's the first rental board we've ridden where paddlers can enjoy an easy grab and a good glide, two leading indicators of sports retention. And the graphics add some flare to it, allowing it to be easily spotted in a color coordinated fashion. 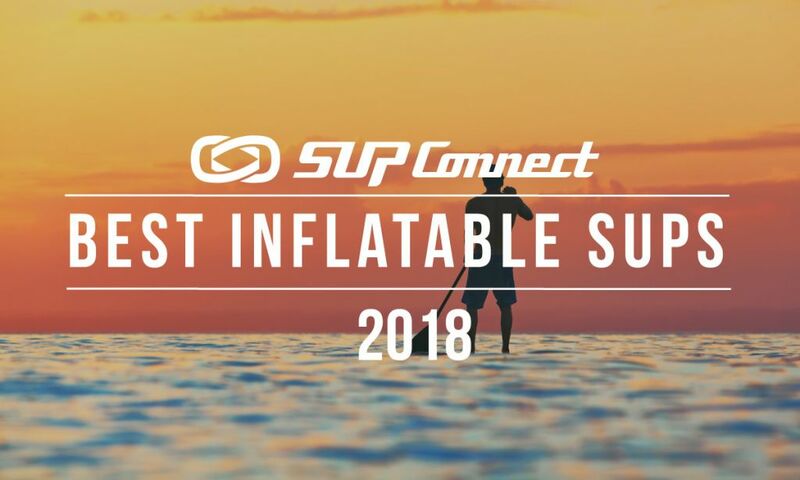 With that, Surftech's Lido takes Rental Gear of the Year top spot in the Supconnect Awards 2018. Few are the brands that constantly surprise you. Starboard is one of them. Svein Rasmussen, Starboard’s founder and president, is constantly on a quest for the next big thing. And every year when the Supconnect team gets boxes from the brand, it’s like unwrapping that chocolate candy bar, which just might have that one go golden ticket. And this one was that golden ticket. The Starboard inflatable touring came with an unprecedented, quite advanced double chamber technology. That not only makes the board more stiff in critical areas, but also makes it compliant with certain Coat Guard requirements for distance paddling. That second, built-in chamber acts as a safety flotation device in case the main chamber deflates, for whatever reason. Double chambers are not new, but Starboard's execution is indeed a sight to see. And for that, the Starboard Double Chamber in its Touring model takes the Technology Gear Award in the Supconnect Awards 2018. Standup paddling can be quite leisurely but also an epic body workout. And for those athletes, especially the multi-sport bunch storming the paddle scene, the Suunto Spartan is the perfect companion. While exuding some of the most accurate measurements over their competitors in areas like bike riding and running, the Suunto Spartan also offers a SUP mode, which can be highly customizable to share the desired metrics and even sync with various pods. Designed and built in Finland, this is the classy, state of art, reliable choice for the multi-sport athlete who is serious into paddling. And that’s why the Suunto Spartan is winner of Accessory Gear of the Year in the Supconnect Awards 2018. There is more than meets the eye when it comes to inflatables. For the older folks, inflatables might be that pool dolphin, bobbing around and not really able to be anyone's ride. Today's inflatables have undergone quite a transformation, much like landlines to cell phones. Borrowing from military-grade technology, inflatables now use drop-stitch chambers, reinforced layers, rails and stringers. In fact, they are so stiff that responses are nothing short of awe. Enters Red Paddle Co. With decades of experience in fabrics and aerodynamics, the company delivers a board with subdued graphics but loads of tech. The materials, pump and accessories stand among the best when it comes to inflatables, delivering a truly premium experience. For the board design, construction, and graphics package in the Red Paddle Co. Ride, the brand takes Inflatable Board of the Year in the Supconnect Awards 2018. Congratulations to all of the winners and nominees of the 2018 Supconnect Gear of the Year Awards! The winners of the remaining 7 cateogories in the Supconnect Awards can be found HERE.